I Buy Way Too Many Records Dot Com: Unwound - Negated 7"
Welcome to another Unwound Wednesday. I probably only have a few more of these left honestly, but this one is a good one. With a gun to my head, I'll probably pick this as my favorite of the Unwound 7"s. At least, it was for sure when I was younger. It came out in 1994, right around when my favorite full length, New Plastic Ideas, was released. The 3 songs on this 7" are of the same spirit. 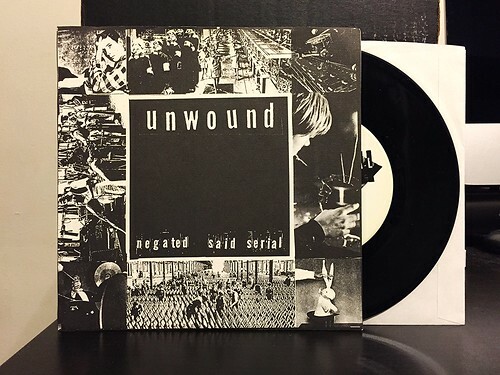 In 1994, I'm not sure if anyone had mastered the quiet/loud dynamic as good as Unwound had. They manage to take things down, dragging the song through Vern's sludgy bass and then just explode into chaos, energy and furious guitar. "Negated" and "Said Serial" are both worth the price of admission alone, but even the 3rd, mostly instrumental song "Census" is still pretty great.